Titanic:The Artifact Exhibition opens at Cleveland’s Great Lakes Science Center on 1 June and will run until 5 Jan 2014. Ticket prices vary. Nonmembers: $24 adults, $22 youths 2-12. Members: $10 adults and youths 2-12. Further information at GreatScience.com. Deep Submergence Vehicle (DSV) Alvin, originally built in 1964, has completed $41 million redesign and refit. The revamped DSV is now aboard the R/V Atlantis for certification testing off California and Oregon. The refit has increased Alvin’s weight which includes a new titanium sphere allowing it dive deeper than before. The new sphere is wider making it more comfortable for personnel aboard. Enhanced science payload, lighting, high definition imaging systems along with a much improved command and control system. A new type of foam is being used, syntactic, that replaces the old air bubble system. Syntactic is made up of microspheres made of glass and other material allowing it to take more pressure. Tillberg Design of Sweden has been selected to design several interior areas of Titanic II. Tillberg will help design first, second and third class accommodations. It also includes the smoking room, first class lounge, Cafe Parisian, the grand staircase and safety features. Amy’s Baking Company (ABC) has become a teaching lesson for business schools–in how not to deal with the public. And thanks to social media, the lesson has spread far and wide. Samy and Amy Bouzaglo totally underestimated the negative response generated by the episode. Many people were suspicious, like a local food critic who was asked to report on ABC. That critic had not heard much about the restaurant except for the famous Amy blowout to a local food blogger in 2010. Crazy Amy, as she is now called, went national thanks to Kitchen Nightmares (KN). As that critic dug deeper she began to realize something was indeed amiss at ABC. And what was seen on the show has been confirmed by workers and customers interviewed later. And their crude attacks on the negative postings after the show confirmed that what they saw on the show was exactly who they–the Bouzaglo’s–really are. One thing that food critic realized is that in all the time that ABC has been open, it never generated any buzz. In a sea of restaurants in Scottsdale, ABC never distinguished itself in any way. And that is telling. With mixed reviews on Yelp and elsewhere, there was nothing really that drew you to ABC unless you were just in the area and wanted to give it a try. Sometimes you might get lucky and get an okay meal. Or get an underdone pizza with a side of nasty attitude when complained to Samy. A recent trip by a local business writer found their drinks had bugs in it. And despite subsequent replacement drinks, the bugs were still in the glasses. Samy asked them to leave after that and they went down to a more popular restaurant to finish the meal they never had at ABC. They did give the server money to go up to ABC to get a pastry, which was delicious, but their treatment at ABC confirmed what was shown (except Crazy Amy never made an appearance). A few seasons back Gordon went to a Philadelphia restaurant run by sisters who never ran a restaurant before. The speciality was potato (in fact that was in their name) but the food was terrible. The restaurant was empty and Gordon helped them revamp the menu. He also brought in a chef consultant to help the young chef, in fact a niece of one of the sisters, and things began to improve. A food critic that had given them a terrible review gave a glowing one after the relaunch. And for a while things were going good. Then that chef left and food quality declined. Restaurant hours changed and closing early, like 8pm on a Saturday night. By summer’s end in 2010, the restaurant closed. I bring this up because there are some similarities here. Neither Amy or Samy have any previous restaurant experience. They have mixed reviews on Yelp. While local restaurants are packing them in, many tables are empty at ABC. Their over-the-top reaction to critics made things far worse and people looking for more dirt on the couple. Which they did find out. Crazy Amy was locked up for using another persons social security number to obtain a bank line of credit. She also has other prior legal issues as well. Samy is facing deportation. The exact reason is not known but possibly due to not disclosing criminal convictions in Europe in his residency application. Questions are raised about whether ABC actually cooks those wonderful pastries. Evidence suggests they are bought elsewhere and resold by ABC. There is also a disquieting rumor that ABC is a money laundering operation. Amy and Samy wanted to let loose about Gordon Ramsay, KN and online critics with a press conference. Lawyers for the show sent a strongly worded letter reminding them of their contractual obligations, which meant they faced huge monetary damages if they violated. I suspect that guy in the funny toque and stripped pants down in Nashville got a similar letter after letting loose to the National Inquirer. I wish they had let Crazy Amy and Samy the Hammer have their press conference. It would have been memorable. They hired a public relations firm that handles such fires but they bowed out after a few days owing to a difference in strategies. The had a quiet reopening with a security guard to keep things civil. Attendance was thin and no one reports the restaurant is packing them in. Lots of gawkers wanting to see the now infamous ABC and perhaps get a glimpse of the pair as well. The future does not look well for ABC. Restaurants that generate negative buzz rarely thrive. And profit margins are thin for restaurants. The restaurant did finally generate a buzz but not the one wanted by Crazy Amy and Samy the Hammer. And for business schools, ABC is a case study is how not to run a business or handle major public relations crisis. Apparently Crazy Amy did give an interview after the warning letter to Radar Online. In the interview, she said some nasty things about Ramsay. That could result in Fox suing her for breach of contract. 1. After substantial refurbishment, SS Nomadic–the last remaining ship of White Star Line–is ready for visitors after seven years work and £7 million spent on the effort. The tender was built in 1911 at Harland & Wolff to ferry passengers to and from ships like Titanic, and served in that capacity until 1968. During World War I it served as a mine sweeper and troop carrier. In World War II it helped in the evacuation of Cherbourg. For many years it served as a floating restaurant near the Eiffel Tower. It ended up rusting away after that facing being sold for scrap before it was bought up at auction in France in 2006. Nomadic will officially open in June. To purchase tickets and more information, go to nomadicbelfast.com. 2. Crime reports are not often reported here but this one has a Titanic connection. The Yorkshire Evening Post reports that a recent theft at Moorthorpe Recreation Club involved some rare Titanic collectibles. The club had been closed for rennovations when thieves broke through the roof and entered the club. 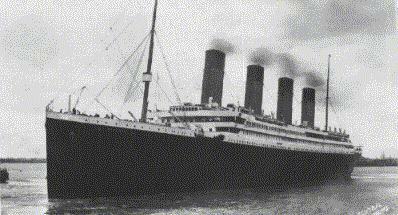 Among the many things taken was the last SOS telegram sent by Titanic to Carpathia along with a picture of the ship. They also stole many autographed pictures of sports legends. A reward of £1,000 (about $1,512) is being offered for information that leads to the arrest of those responsible. BBC News is reporting that the Hartley violin–now on display in the United States– underwent a CT scan at BMI Ridgeway Hospital in Wiltshire. A 3D image was made to examine the violin from the inside. 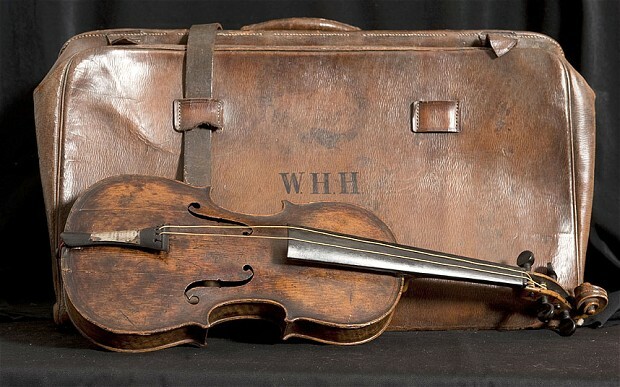 Astrid Little, the hospital’s imaging manager said: “The scan revealed that the original wood was cracked and showed signs of possible restoration.” The auction house of Henry Aldridge & Son believes this and other things proves it was Wallace Hartley’s violin. He counters Titanic author Daniel Butler, who claims the violin glue would have come apart due to exposure to salt water, by saying the glue used was animal glue. Such glue melts when heated but not when cold, says Aldridge. The Hartley Violin will be making its first American stop at Titanic Museum in Pigeon Forge, TN. It will be there from 22 May-27 July. It will the go to Titanic Museum in Branson, MO from Aug 1-5. An auction date for the violin is set for 19 Oct at Henry Aldridge & Son. 1. A local school in the UK has developed a unique connection to Titanic due to a local man descended from J. Bruce Ismay. Terry Ismay, a great-grandnephew (with several greats in that) of J. Bruce Ismay, has been given a spot on Titanic II by Clive Palmer. His two children attend Cordeaux Academy in Louth so he decided to give them access to the new ship through the Internet. They will have access to the ship’s development with regular updates and where the construction is going on. There is also the possibility they will have their own flag on the ship. 2. James Cameron is to be be honored by Scripp’s Institution of Oceanography in California with the 2013 Nierenberg Prize for Science in the Public Interest. The award is given to those who further understanding of the sea. Cameron’‘s sole dive in the one man submarine Challenger Depth on 26 Mar 2012 went 6.8. miles down, the first solo diver to that depth. Additionally he donated the lander used on that mission to Scripps. He also plans to donate the $25,000 Nierenberg prize money to Scripps for the new Lander Lab. 3. 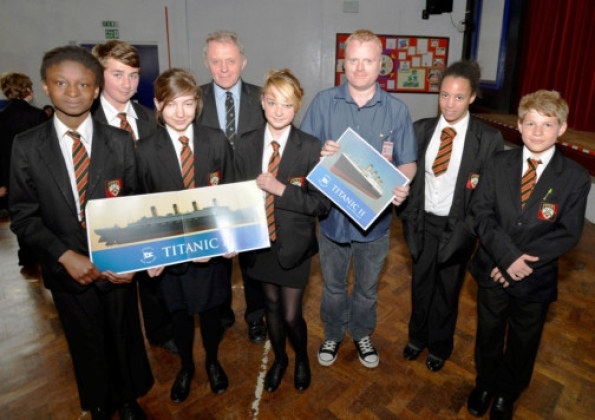 Writing in Huffington Post, Stephen Coan–president and chief executive of Sea Research Foundation–is not happy with Titanic’s salvage and that artifacts raised by RMS Titanic, Inc, are to be auctioned off. He cites a Marist poll indicating the wreck ought to be a memorial. 65% of those polled agree with the proposition it ought to be a memorial site. I am puzzled by the timing of this piece. There are not going to be further salvaging by RMS Titanic, Inc (now part of Premiere Exhibitions) which holds the legal right awarded by a federal court in Virginia. And it has been declared a maritime preserve by the United Nations with the consent of the Canada, Britain, France, and the United States. There will be no further dives down to look at it either (which cost about $30,000) for tourists to look at the wreck. As for the auction, that is still up in the air. No one is saying what is going on in that regard. It seems the only point of the piece is to tell the world that Mystic Aquarium has a Titanic exhibition without using Titanic artifacts. Update#1- 20 May: The Phoenix Business Journal is reporting that Amy’s Baking Company has canceled its planned Tuesday press conference. It also reports that Rose+Moser+Allyn Public & Online Relations, is no longer working with them. The reason for the cancellation was due to online bullying. No word why the PR firm no longer works for them. Update#2-20 May: The Phoenix Business Journal reports that lawyers for Fox and the Kitchen Nightmares production company threatened legal action. The letter reminds them of their contractual obligations and their conduct exposes them to $100,000 in liquidated damages. You can view the letter here. Jason Rose explains the “there were differences on public relations strategies” that led to the split. It is over a week since Kitchen Nightmares(KN) ended its season with Amy’s Baking Company, and it is still reverberating around the web. Yelp has seen massive amounts of reviews though most of them were not actual restaurant reviews. Many will be deleted since that violates Yelp’s Terms of Service. Comments on Yelp and other places drove Amy and Samy crazy. They used Facebook to respond and not in a kind way. Those posts have been deleted and now claim they were hacked. And they now have hired a public relations firm, Rose + Moser + Allyn Public and Online Relations to handle future communications. The damage has been done and many see their angry responses as doing more harm than good, perhaps cementing forever the image of them being crazy and flying off the handle at any criticism. Worse it appears they will likely face an investigation by over the tips issue. According to KTAR, it is a violation of Arizona law to keep tips from servers. Despite their claim on Facebook, Samy admitted on camera he does keep tips and never shares it with servers. Now they say they do not “confiscate” tips from servers. That is an artful dodge but that is not the accusation. The accusation is (and confirmed by Samy) that do not get tips left by customers. That might be construed as possible theft if the tips are considered property of the server under Arizona law. With Samy’s admission on camera and sworn affidavits from ex-employees, Amy’s Baking Company could be hit with fines and other sanctions. That might be just the beginning. Owing to her past criminal conviction of fraud (using someone else’s social security number to obtain a line of credit), tax authorities might check her books to make sure everything has been correctly reported. Then there is the real possibility of civil lawsuits looming over workplace harassment. Considering what was shown and what has been reported, a lawyer could make a real field day here by seeking damages. Then there are questions as to whether she actually bakes those wonderful pastries we saw on KN. We never saw her cook any pastries and there was a Facebook entry, allegedly from Amy, that seemed to confirm the allegation. No doubt enterprising reporters will track down various bakeries in the area or beyond to see if she buys from them and resells at her store. She may use an alias in purchasing them (or even a third party) to conduct the transactions. In due course we will learn the truth. It is odd that an experienced baker would not know the difference between cooked and uncooked pizza dough as evidenced on the show. What happened is being touted by public relations experts on how not to deal with bad publicity. Instead of getting in front of the story, they threw more gasoline on the fire rather than cooling water. And with so much negative publicity, even the best public relations expert is going to be of little help. Most predict that Amy’s Baking Company will close at some point because customers will be scarce and even Samy cannot pour money indefinitely into the restaurant to keep it afloat. Most likely they will sell the restaurant and move away no doubt cursing Scottsdale, the entire state of Arizona, and Gordon Ramsay on their way out. Since writing this, I learned that Amy’s Baking Company is re-opening on Tuesday, 21 May. According to their Facebook page, some proceeds from reopening night“will benefit a charity organized to bring awareness to cyber bullying.” The press release also states: “The owners will likely be holding a press conference before the Grand Re-Opening and answer falsehoods depicted on a reality television show, including assertions that the restaurant confiscates tips from servers.” Again note they hedging in the above statement. It says “likely will be holding” which is not the same as will be holding. Also one wonders if this will be a real press conference or simply a venue for them to repeat their responses and accusations they have already made. Again note the word “confiscates” is being used. Nice try but no one will believe that spin. Sir William White (2 February 1845 – 27 February 1913) is a name unknown to many unless you are a maritime historian or a naval architect. During his time as chief constructor of the Royal Navy, he oversaw the construction of numerous battleships, cruisers, and unarmored warships. He retired in 1902 after suffering a nervous breakdown in 1901 due to a mishap involving the royal yacht Victoria and Albert. 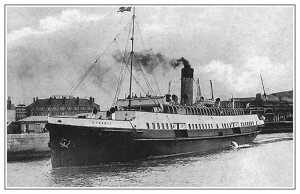 He went to work for Cunard as a consulting architect for RMS Mauretania. He also became president of Institution of Civil Engineers, Institution of Mechanical Engineers, and Institution of Marine Engineers. From 1909-1910 he was council chairman for the Royal Society of Arts, and was governor of Imperial College until his death in 1913. His contribution to Titanic came during the American inquiry. He penned a long letter to The Times about how the media had sensationalized the story resulting in premature opinions as to what happened. While the lifeboat issue was certainly important, naval engineers had to come up ways to keep the ship from sinking when they collide with icebergs. Merely slowing down would not be enough (and passengers might not like moving slowly across the ocean). 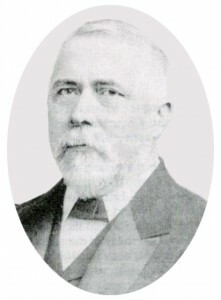 White argued for improving the water-tight subdivision of ships. The Titanic used transverse compartments that ran the width of ship which did not work. He proposed future designs add longitudinal compartments that ran from bow to stern. Many ships were retrofitted after Titanic’s sinking, like having their double bottoms extended up the sides to the waterline giving them double hulls (this was done on Olympic). Other ships altered the height of the bulkheads to make them fully watertight. 4. An Expert On Titanic Wreck:Sir William White’s Deductions From Result of American Enquiry, Montreal Gazette, 31 May 1912 (available through Google). Back in the day when President Harry Truman wanted to get away from it all or hold important meetings. he went aboard the yacht USS Williamsburg. Originally built as a private yacht in the 1930’s, it was well decorated for such uses. Then came World War II and she was converted into a gunboat. 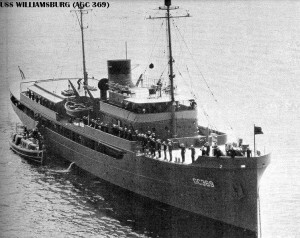 When the war ended, she was selected to replace the USS Potomac, which had served as a presidential yacht under President Roosevelt. During Truman’s presidency, it became known as the seagoing White House hosting many dignitaries such as Winston Churchill. She also was President Eisenhower’s yacht as well for a time but he decommissioned her in 1953. She was struck from the Navy list in 1962. The Williamsburg ended up at Woods Hole Oceanographic Institute in 1962 where she was overhauled for marine research. All the presidential staterooms and yacht like trappings were removed. She was renamed Anton Bruun, a noted Danish marine biologist. 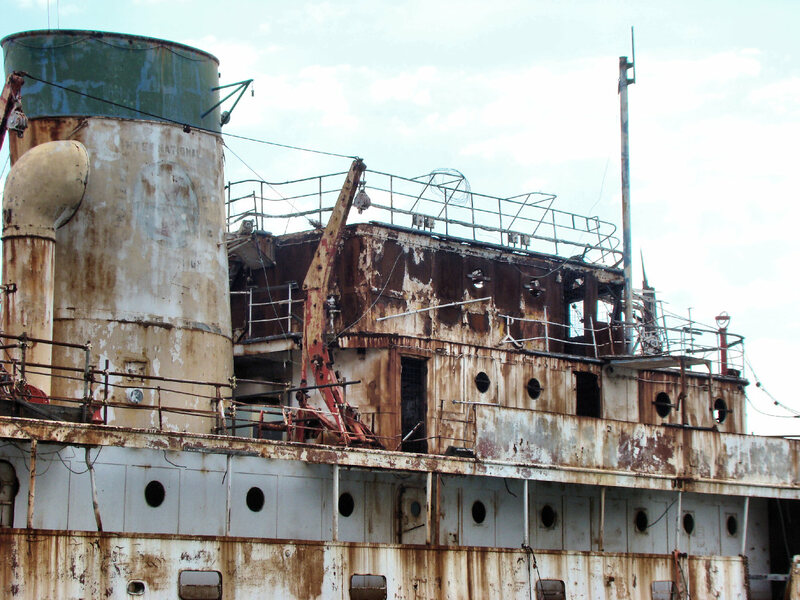 She did several scientific cruises but suffered severe damage in 1968 due to a dry dock mishap. Deemed too expensive to restore, in 1971 she was put up for sale. It was bought up for commercial use as floating restaurant in New Jersey. In 1993 it was sent to Genoa, Italy for conversion into a luxury cruise ship. That never happened and was going to be scrapped. Some last minute intervention with the Italian government prevented that but the ship remains at La Spezia, Italy slowing rusting away. A preservation society has been formed (USS Williamsburg Preservation Society) and it is for sale by Lloyd’s Yacht & Ship Brokers. When you see pictures of what it was like back in the day, it is sad to see where it finally ended up. It would have been better scuttled at sea rather than ending up as it is now.